Some Native Americans believe volcanic landscapes are sacred, and this may be one of the reasons so many petroglyphs (over 20,000 images) are here. Not all the petroglyphs were made by the Ancestral Puebloans. In the 1700’s or 1800’s, Spanish shepherds may have left their marks of Christian crosses, pictures of livestock and their brands. Unfortunately, there are also more modern marks made before this landscape was protected. Geometric and abstract images are among the oldest petroglyphs in the monument, dating back 2000 to 3000 years ago. There are many images of people. There are images of animals and plants. And if this is not a rocket ship, well then, just what is it? According to Wikipedia there are 59 National Parks and 109 National Monuments. We have been to 32 of the National Parks and 16 of the National Monuments. I guess that may be considered impressive and that does not include National Recreational Areas. Most of the National Monuments I have never heard of, including the Kasha-Katuwe Tent Rocks National Monument, which is 55 miles northeast of Albuquerque. A friend of mine knew of it and suggested we hike there. This area was named a national monument in 2001 and includes 4,645 acres of public land. The words kasha-katuwe mean white rocks. Rocks found here were formed 7 million years ago when 20 small volcanoes erupted repeatedly. The tent shapes were caused by erosion from wind and water. They have two trails there, the slot canyon trail and the cave loop trail. Together they are just over three miles. All of the hike was scenic, with views of desert flora, cliffs and the tent rock formations. Hiking through a slot canyon is always interesting with its twists and turns. There was a steep incline after the slot canyon that led to outstanding views. If you find yourself in this area, I highly recommend this hike. Hiking through a slot canyon. Looking up in the slot canyon. Looking through the end of the canyon. This canyon had some narrow places. These tent rocks looks like a village. The view from up here was fantastic! Looking down on the tent rocks. We really enjoyed hiking with Mike and Pam. The Apache Plume is a shrub. It has white flowers. Older flowers develop seed clusters. The pink feathery tails you see in this picture are the seed clusters. Apache Plume seed cluster and its white flowers. The seed clusters of the Apache Plume was just glistening in the sunlight. I just adore the seed clusters of the Apache Plume. Lorquin Admiral Butterfly on Chamisa of the Aster Family, also known as Rubber Rabbitbrush. Page sits on Arizona’s northern border. Lake Powell is located in Arizona and Utah, mostly Utah. In Utah is the Grand Staircase-Escalante National Monument, spanning nearly 1.9 million acres. We drove Route 89 from Page to Kanab, about a 70 miles stretch. The Toadstools Trail was our first stop. This is a scenic trail that is less than a mile long and leads you to the area where the toadstools are. A toadstool is a spire-like feature with a boulder balanced on top, giving the appearance of a mushroom or toadstool. On our way back, we could see a thunderstorm was coming our way, so we picked up our speed to get back to the car. We made it back safely. We made one other stop before we reached Kanab. It was a pretty area and we wanted to walk around it a little. We were on our way back to the car when the thunder started. Once again we had to rush back to the car. Further on down the road we ran into rain. There is a visitor center in Kanab and we stop to inquire about hikes in the areas. Unfortunately, they had rain the day before and the hikes took you into canyons where water was still flowing. They suggested the Coral Pink Sand Dunes State Park. We went there and I wanted to walk around the dunes, but again, a storm sent us back to our car. Back to Page we went, but not without hitting rain again and even some hail. Not a real successful day of hiking. The next morning gave us a beautiful sunrise. John woke me up for this and while I was photographing the sunrise, it began to drizzle. I turned around and there was a sight to behold. A beautiful rainbow with our RV right in the middle. The Colorado River gently runs by Page. We did a river raft adventure starting at the Glen Canyon Dam and floating past Horseshoe Bend. Then they used motors to get us back to the dam. It was nice gently floating down the Colorado with Glen Canyon towering above us on both sides. We stopped at a beach down river for a bathroom break and a short hike to see some petroglyphs. There was nothing exciting about this trip, but it was nice. We hiked one afternoon to Horseshoe Bend overlook. You can get right up to the edge of the cliff to see Horseshoe Bend. It is a long way down and there are no guard rails. We waited for the sunset hoping that it would be good, but there were too many clouds. I still got some good shots of Horseshoe Bend though. Lake Powell is a beautiful lake. We didn’t do a rental boat or a boat tour since John and I had spent a week on a houseboat on Lake Powell a number of years ago. If you get to this area, I would certainly recommend you do that though. It really is awe-inspiring. Our next stop is Albuquerque for the Balloon Festival. Leaving Sedona turned out to be quite an experience. John decided it would be best to take the southern route out of Sedona and hit I-17 to travel north. The other road out of Sedona is 89A and it is a narrow two lane road with hair pin curves and uphill. Our RV does not go up steep hills well, slowing way down and holding up everyone behind us. We came into Sedona that way and we saw all the pull offs were barricaded because of damage from flash floods. I-17 seem to be the best choice, even with its steep upgrade for many miles, at least people would be able to get around us. To go that way though, you have to go through nine roundabouts. We didn’t think that would be a problem. When we stopped for fuel in Flagstaff, we saw that one of our tire straps holding our car on the tow dolly, had come off. We guessed it was because of the tight curves on the roundabouts. Our tire rode up on the dolly a bit causing the dolly to get up against the car on turns. 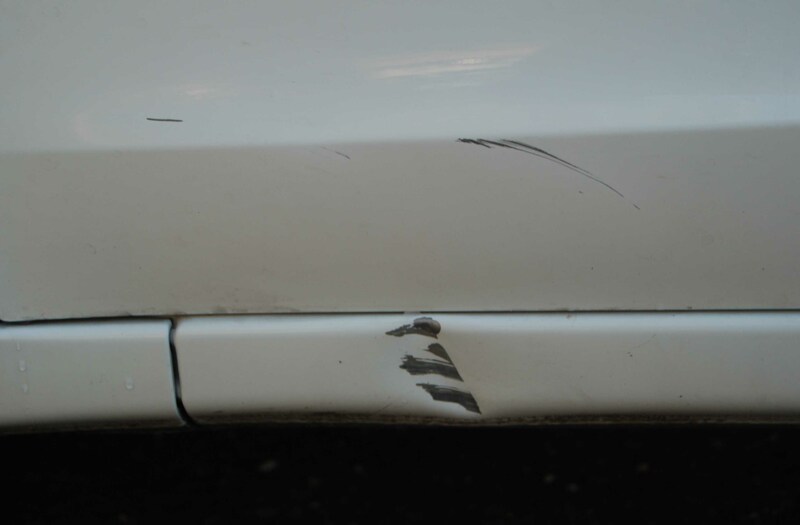 The bottom strip on the car is dented and a big patch of paint is scratched off the door. The passenger door was damaged by the dolly on a trip to the Florida Keys. Time to get rid of that dolly. We just bought this 2011 Honda Accord in May, without a blemish. It truly brought tears to my eyes. Oh the joys of RVing. The scenery from Flagstaff to Page is superb. You pass by canyons, rock formations and the painted desert. I just kept snapping pictures as the scenery flew by me. Some of the pictures turned out pretty good. We are camping in the Glen Canyon National Recreation Area in the Wahweap Campground. The campground is very nice with all its desert flora, but watch out for the sand spurs. They have big ones here and they are all over! We have a great view. Unidentified – This is growing all around the campground. After we got settled into our site, we rode into Page to the visitor center to pick up maps and get some information on hiking and other activities. When we were approaching the Glen Canyon Dam, we noticed a sign about a guided hike at 5:30. We decided to do that. It was a half mile hike through the desert to a hanging garden. The ranger gave a very informative talk about how this area was formed and about John Wesley Powell’s expedition down the Colorado River in 1869. The evening sun was making the sandstone glow. This is hanging garden. Maidenhair ferns and orchids grow here. Hard to imagine these plants growing in a desert. Our guide gave a very informative talk. We have a Jack Rabbit hanging around our campsite at times. His long ears help keep him cool. They are very thin and as blood runs through the vessels the heat is radiated out through his ears. Those big ears help keep him cool. Look at his long legs and tail. Tomorrow we are doing a photo tour inside three slot canyons. We had planned to do one during our travels last year, but due to delays leaving home, we had to scratch Page, Arizona from our itineray. Not this year.